The capital's best and biggest 10Km race! 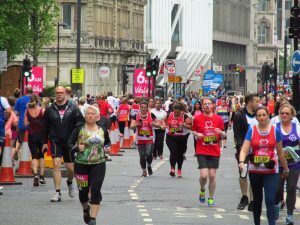 This event starts (and finishes) in The Mall and follows a clockwise route around the City of Westminster and the City of London. Runners pass many of London’s famous sights, including Admiralty Arch, Nelson’s Column, St Paul’s Cathedral, Mansion House, Bank of England, Leadenhall Market, The Monument, Millennium Bridge, Tate Gallery, Cleopatra’s Needle, London Eye, Big Ben, Houses of Parliament and Westminster Abbey. If you're looking for a 10k in London, this is the one! A huge cheer from us at our on course cheer point! A celebratory post run meet up for cold drinks, food and photos.